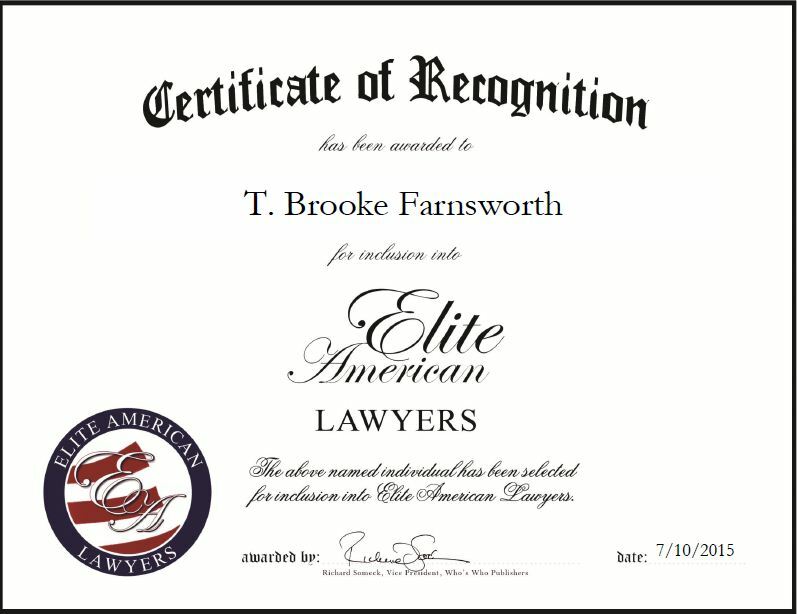 Houston, TX, July 10, 2015, T. Brooke Farnsworth, Attorney at Farnsworth & vonBerg, has been recognized by Elite American Lawyers for dedication, achievement and leadership in oil, gas and energy litigation. More than 40 years ago—in 1971—President Richard Nixon imposed wage controls. At the time, T. Brooke Farnsworth was the youngest lawyer at his then-firm. For this reason, he and another colleague were assigned the task of learning the rules and regulations, as well as how the prices and wage controls worked. This assignment led Mr. Farnsworth to attain experience in advising boards and companies on the subject. Though the wage controls were soon put to an end, the controls on oil and gas remained. Mr. Farnsworth became involved on the regulatory side of the matter and was hired by a publicly-traded oil company in 1974. During the four years that he was working for the company, he negotiated the first production-sharing agreement with an American Indian tribe. Since then, Mr. Farnsworth has been providing top-notch legal services to clients in the areas of oil, gas and energy litigation, as well as business and corporation litigation, acquisitions and financing. As a skilled and trusted attorney at Farnsworth & vonBerg, LLP, he not only litigates on behalf of his clients, but he also aggressively negotiates transactions and, in order to further his knowledge, regularly attends seminars and presentations. Farnsworth & vonBerg, LLP provides a comprehensive range of services to both domestic and international oil and gas clients in a multitude of areas pertaining to business, individual and employment law, including new-business formations, business transactions, due diligence reviews, intellectual property issues and deferred payment arrangements. Additionally, the firm handles cases involving shareholders, financing, contribution and non-compete agreements. The highly-experienced attorneys at Farnsworth & vonBerg, LLP understand the many challenges that oil and gas clients can face. They have worked together to establish a proven track record in trying contested cases in both state and federal courts. The firm has handled cases in numerous areas, including interest owner disputes, development rights and obligations, drainage issues, offshore marine construction and trade-secret matters among many others. Passionate, committed and reliable, Farnsworth & vonBerg, LLP has been a leading firm for more than four decades. With a desire to help people by providing a service that they can’t provide for themselves, Mr. Farnsworth has learned the importance of integrity and competence in the courtroom. He effectively and professionally argues each case before the judge and jury in a way that all people will understand. His favorite part of the job is being in the courtroom, arguing motions and, ultimately, winning, as he finds that the most rewarding aspect of his profession is securing the best possible result for every client. Mr. Farnsworth has been consistently recognized for his commitment to the industry, as he holds a prestigious AV Preeminent Peer Review Rating with Martindale-Hubbell. Additionally, he has been featured in Who’s Who in America in 2002, Who’s Who in the World in 1987 and Who’s Who in American Law in 1985. Originally, Mr. Farnsworth wanted to become a college history teacher. After reading a book about the renowned American defense attorney Clarence Darrow, however, Mr. Farnsworth realized that he wanted to pursue a career within the legal sector. After receiving a Bachelor of Science in Business from Indiana University in 1967, he subsequently went on to earn a JD from the university’s Indianapolis Law School in 1971. 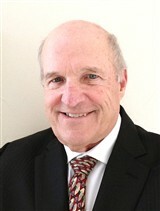 He opened his current firm in 1978. Since joining the field of law, Mr. Farnsworth has become an extremely active member of the community. He maintains affiliations with various organizations, including the Houston Bar Association, the State Bar of Texas, the American Association for Justice and the American Bar Association. Additionally, Mr. Farnsworth is a sustaining life fellow of the State Bar of Texas Foundation, as well as a fellow of the College of the State Bar of Texas. Looking ahead, Mr. Farnsworth aspires to continue down the same path of success by continuing to provide top-notch representation for his clients. This entry was posted in Litigation and tagged AV Preeminent Attorney, business transactional law, commercial litigation, energy, environment law, oil and gas, trials. Bookmark the permalink.